ISIS militant group is the prime suspect in the Ankara bombings that killed at least 97 people on October 10, Turkish Prime Minister Ahmet Davutoglu has said. No group has said it carried out the attack, but the Turkish government believes that two male suicide bombers caused the explosions. 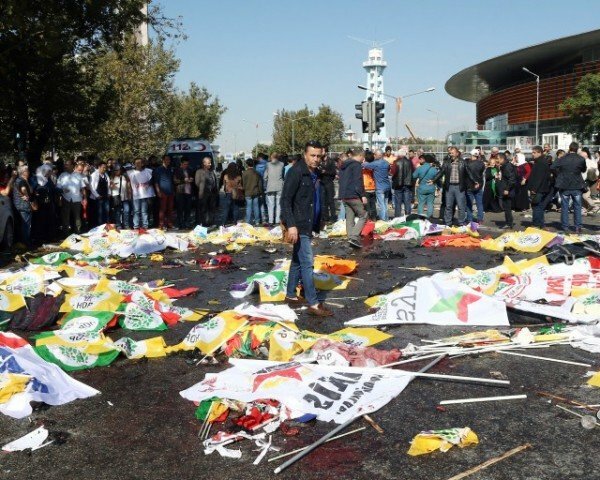 Ankara explosions official death toll is 97, but one of the main groups at the march put the number of dead at 128. The funerals of more of the victims are taking place on October 12. The twin explosions ripped through a crowd of activists gathering outside Ankara’s main railway station. They were due to take part in a rally calling for an end to the violence between Turkish government forces and the militant Kurdistan Workers’ Party (PKK). Speaking on Turkish television, Ahmet Davutoglu said the bombings were an attempt to influence the forthcoming elections, due to take place on November 1 after a vote in June left no party able to form a government. Many of the victims were activists of the pro-Kurdish HDP party, which says it is now considering cancelling all election rallies. The HDP believes its delegation at the march was specifically targeted. The party gained parliamentary seats for the first time in June’s vote, depriving President Recep Tayyip Erdogan’s governing AK Party of its majority. On the day of the attack, the PKK unilaterally declared a ceasefire. However, this was rejected by the Turkish government, which carried out cross-border air strikes on PKK positions in southern Turkey and Iraq on the following day. PM Ahmet Davutoglu said authorities were close to identifying one of the suicide bombers. Some local media have implicated the brother of a man who carried out an ISIS bombing in the southern border town of Suruc in July, which killed more than 30 people. HDP leader Selahattin Demirtas said the state had attacked the people – and that the people of Turkey should be the recipients of international condolences, not President Recep Tayyip Erdogan.